Julie Woodruff has both field and academic experience with a variety of wildlife species. At CCCI, Ms. Woodruff has performed construction monitoring, and assisted with hand capture and netting of California red-legged frogs, capturing and handling eight adults and thirteen larvae under the supervision of a permitted biologist. Additionally, Julie has fulfilled the permit requirements for California tiger salamanders, handling sixty adult salamanders and sixteen salamander larvae under the supervision of permitted biologists. Ms. Woodruff's thesis, “Winter Ecology of the Northern Saw-Whet Owl,” involved extensive radio-telemetry work, vegetation surveys, and owl pellet dissection. She has field experience working with a variety of special-status wildlife species for the US Forest Service, including California spotted owls, northern goshawks, great gray owls, willow flycatchers, mountain yellow-legged frogs, and other nesting bird species. 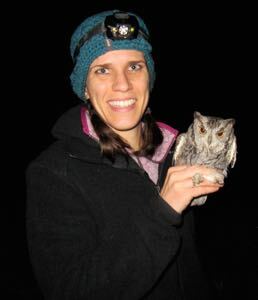 Ms. Woodruff has worked at owl-banding stations, part of the “Project Owlnet” effort to understand northern saw-whet owl migration, and she is sub-permitted to band several small species of owls. Ms. Woodruff also actively leads field trips for Chico’s annual “Snow Goose Festival of the Pacific Flyway,” assisting novice birders in identifying wintering birds. She has also assisted in songbird banding for the CSU Chico Outdoor Classroom, which teaches elementary school children about birds. Ms. Woodruff gained additional experience by volunteering for several graduate research projects, including searching flammulated owl nest cavities, trapping western pond turtle, and assisting with western rattlesnake venom extractions.